As anyone knows, kids naturally loooovee to explore, and what better way to do that than through a fun scavenger hunt while at camp! I love them because it allows children to focus on the little details around them, as well as have some fun sensory play too! Sometimes I bring a premade one, but sometimes I sort of scout around, see what’s there, and make one that’s unique for wherever we are camping at! For example, when we camped in Moab, Utah there was vastly different trees and rocks there than our mountainous hometown of Jackson, Wyoming! To be honest, sometimes camping makes me a little too relaxed (who doesn’t love to hang out in a camp chair around a campfire?? ), and I need a reason to get up and explore! With a scavenger hunt, there is actually a goal and I love being able to walk around and help my little guy find anything we can! Anyways, I just wanted to give you some scavenger hunt ideas for the outdoors that include idea pools, templates, and heck, even some blank templates so that you too can have a fun scavenger hunt and explore around your camp area! What are some fun ideas for nature scavenger hunts around camp? 4 Fun Outdoor Scavenger Hunts… FREE! Are there any different outdoor scavenger hunt ideas or templates you would like to see? 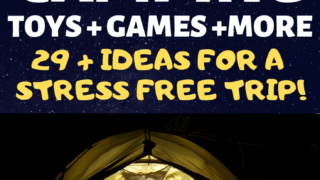 Pin this if you loved it, and check out these other fun camping activities! 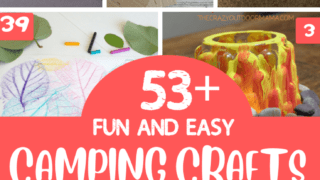 51 Funnest Camping Crafts to Make your Next Camp Out Awesome! DIY Kids Camping Tradition: A Creative Campsite Sign! 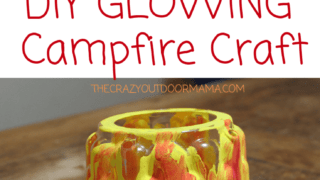 Hand Print Campfire Craft - A Camping Keepsake! There are actually quite a few different ways to go about having a scavenger hunt! This can depend alot on where you are as well as how old your child is. It’s important to not make the scavenger hunt TOO hard or it might frustrate the younger ones- that doesn’t mean though that you can’t have those couple really rare things on the list that they’ll feel awesome if they find! Don’t forget – it’s not a bad idea to have an adult go with small groups of kids (if you’re camping with more than just your own) so as to make sure no one gets themselves into a dangerous situation trying too hard to find something on the list! Anyways, here are a couple different kinds of scavenger hunts! Don’t forget to check out these other 11 fun campground activities for kids here!! This is usually a simple list of items that just need to be seen! It’s best not to encourage kids to pick the items up so that everything is left as it was found for other to enjoy! A couple of rocks or twigs won’t hurt of course if you are somewhere that is legal (National Parks do not allow you to take anything out of them – even flowers and such!) for younger children since it’s pretty darn fun to be able to take your treasures with you! 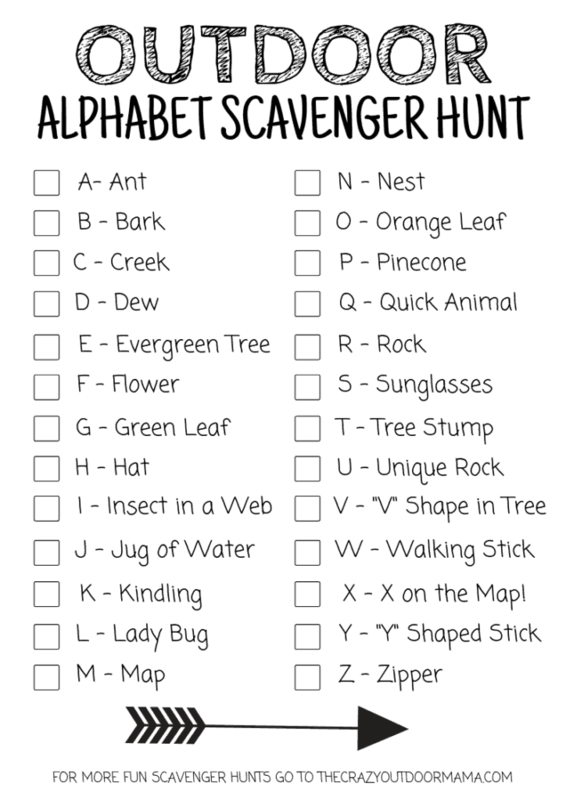 This camping scavenger hunt is perfect for exploring the outdoors! Send me my Scavenger Hunts! I’m so stoked for you to get these! Now you just need to confirm your email! If you’re having a hard time finding my email, it might be in the “Promotions” or “Junk” Folder! This is a really fun twist that is geared for older kids who can opearte a phone camera or anything else that takes pictures. 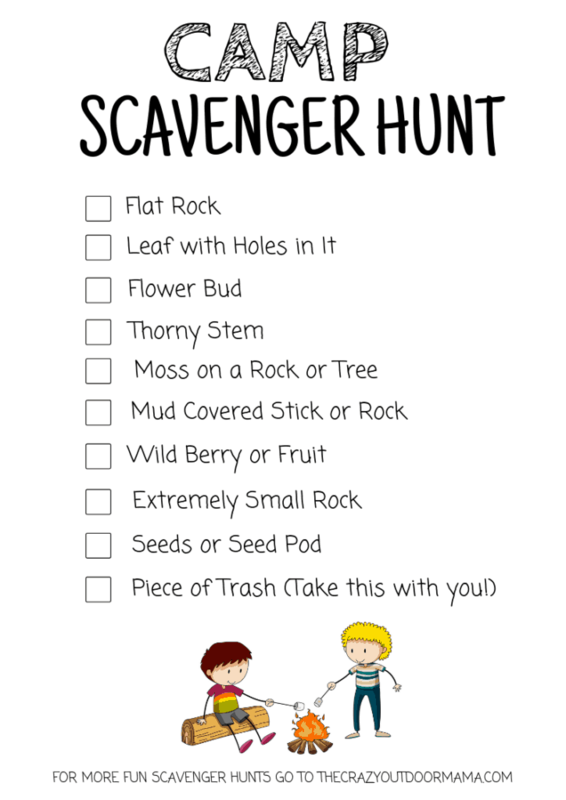 I also like that this adds a little accountability to the scavenger hunt – with older kids, it’s fun to add small prizes for whoever finds the most items, and kids can be really competetive! By taking pictures of each item, not only are you leaving nature undisturbed for others to enjoy (especially for harder to find things!) but they could also be made into a fun collage to remember the big scavenger hunt they had at camp! 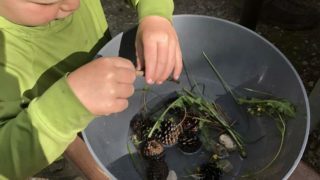 Related: Something fun to do with various treasures kiddos find is make sensory soup!! Printable “recipe cards” included! Sensory scavenger hunts are fun at camp because they really encourage true exploration of the world around them! 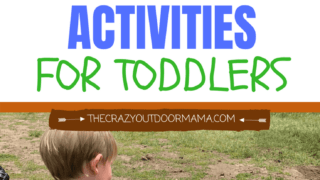 Related: Toddlers love sensory activities – check out all you need to know about camping with toddlers for even more fun! Explore four senses (We’re leaving out taste for this one!) 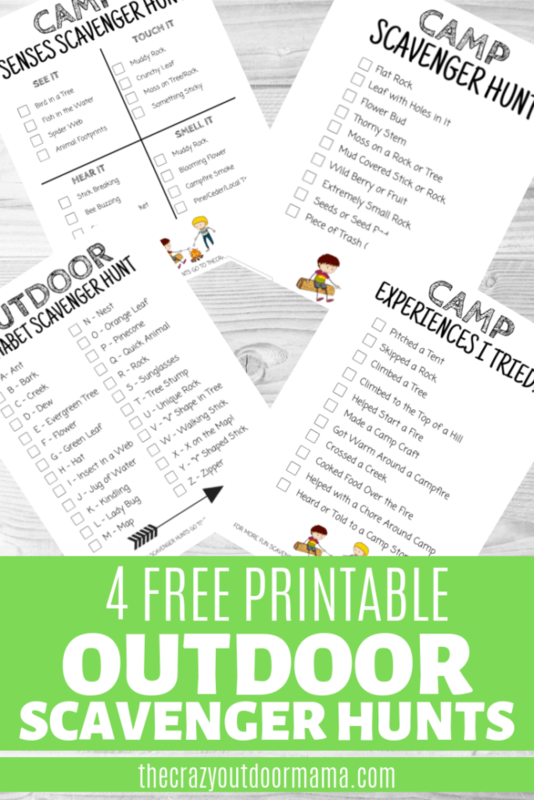 around camp with this printable scavenger hunt pdf that’s perfect for hiking or just exploring around camp! 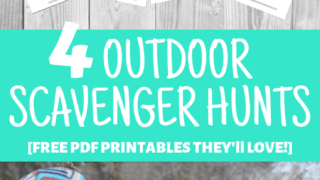 This is a perfect scavenger hunt for the outdoors for the kiddos! 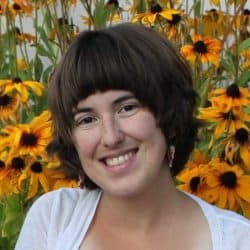 I especially love this idea if summer camp or the big family camp trip only happens once a year – it’s a big nudge to experience as much as you can! Some of the items might include cooking marshmallows, swinging from a rope, starting a fire, finding some edible berries, pitching a tent….. This one will really ensure memories are made, and at the end of the camp trip, it will be a good reminder of how much fun each child had! 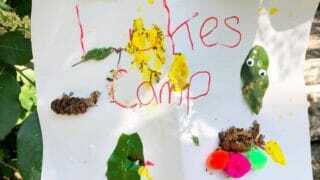 Camp crafts are AMAZING experiences – try making these! 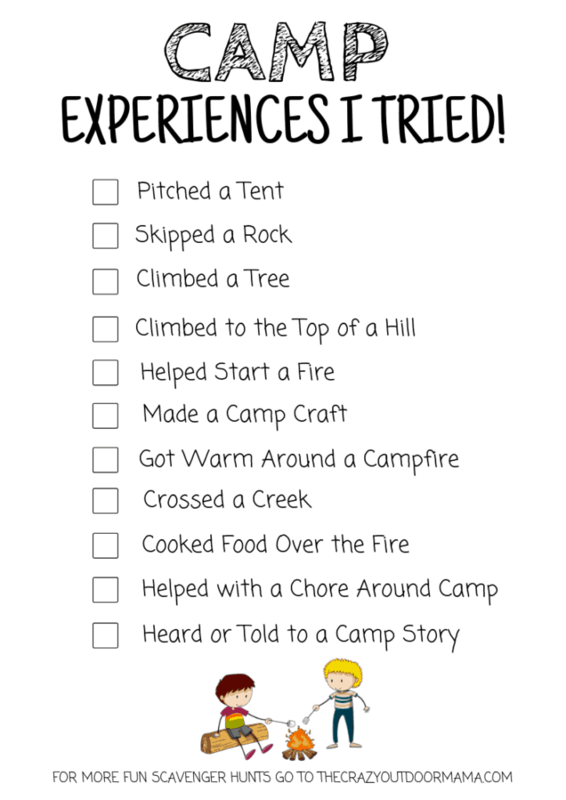 This printable PDF camping scavenger list focuses on experiences – it’s a great way to highlight and remember the fun that was had while on the big camp trip, or for their time away at summer camp! I definitely wanted to specify “outdoor” in this one because it’s pretty likely you won’t be able to find everything around camp! I know you’re first thought is probably going to be “Well what do I put on the list for the hard ones like X, Y and Z? Honestly it was mine too once I first had the thought – but here is what you could do! X could be something “Xtra special” to the child such as a really cool rock, or fun waling stick they find along the wya. Z would have to be the bZZZZZing of a bee! 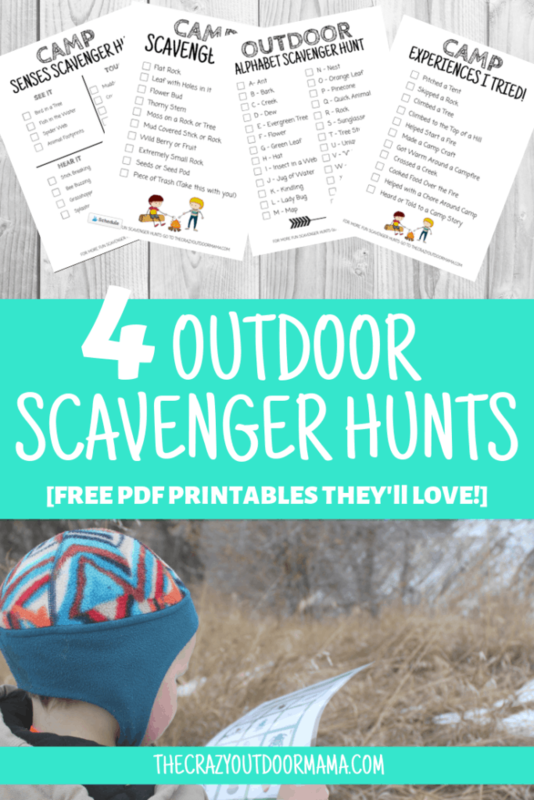 This fun outdoor scavenger hunt is a perfect one to use while hiking since there’s so much you need to find! If you’re camping for a long time it could also be really fun to do with the kids! I had originally wanted to do a more BINGO style, but I also know that not everyone wants to use a ton of color ink when they print these! I hope these scavenger hunt ideas are something you’ll enjoy with the kids the next time you go hiking or camping! I have a ton of prinables in the works, but most of these are saved so I can modify things for you as long as I have time! 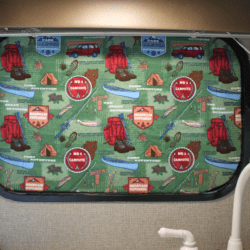 Here are some other camping activities you'll love to do with your kids! This fun and creative camp craft is a good way to keep your kids busy at a campsite while creating a fun memory to bring home later! Give kids a bowl with some water, and it's amazing what happens next! Print out your four free "recipe cards" for added fun and magic! 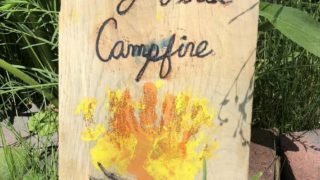 This handprint campfire craft is such a cute thing to do with your baby on their first camp trip - bring it home and hang it on the wall when you get back! 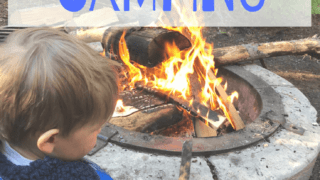 These fun kids camping toys are great for use anywhere - campfire sets for at home, play camping tents for the campground, and even barbie camping sets! There's some camping toy each kid will love here! Bring your next camping themed party or classroom week to life with this GLOWING camping lantern! It's really easy to make, and kids will love having their very own camping lantern craft! Get the kids excited about camping with these cute camping books! Toddlers, preschoolers and older will love these camping themed picture books that illustrate the magic of camping! 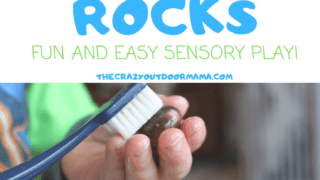 I know it sounds simple, but it's an amazing sensory play experience for kids to play with rocks and water! Let them "rescue the rocks" so that you can get some chores (or relax time!) in and not feel guilty! 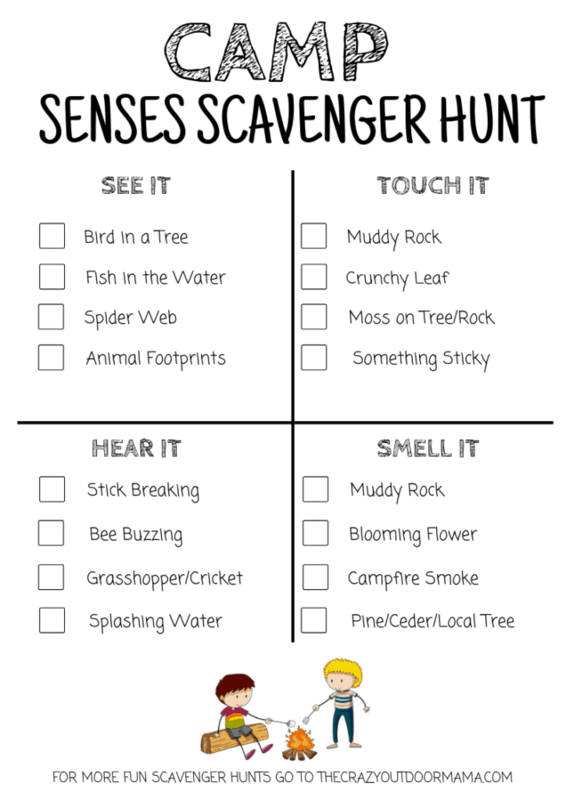 Outdoor Scavenger Hunts are PERFECT to play with kids while camping and hiking! 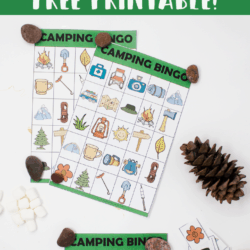 These four printable outdoor scavenger hunts are best for camping, and focus on abcs, sensory, experiences and of course your traditional scavenger hunt! Make this five minute quick and easy campfire craft that actually glows! 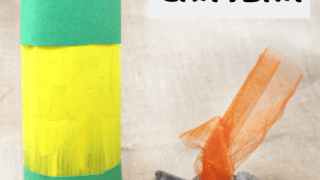 This DIY campfire is perfect for pretend play in the classroom or at the next camping themed birthday party! Celebrate your next family camp trip or summer camp with friends and make these pretty (and EASY!) camping necklaces! 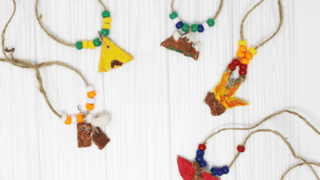 Make a camp necklace with your favorite memory with this fun DIY!